One Piece has put Monkey D. Luffy through the ringer as of late, but the anime just made up for it. At last, the pirate upgraded his Gear Four form, and the reveal came with a whole slew of new attacks that are ready to see how over-powered Luffy can get, then your time has come. Recently, One Piece stepped out with its latest episode which update dove into an epic clash. 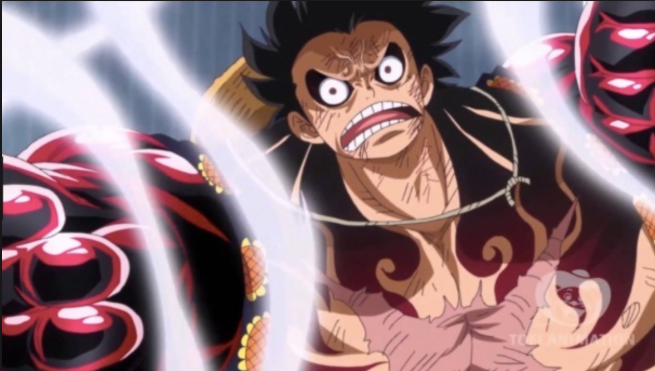 Luffy has hit the climax of his fight with Charlotte Katakuri, and both men are ready to go down swinging. After revealing his Snake- Man transformation, no one knew what to expect from Luffy, but we think his new attacks live up to their expectations. The fight start with Luffy unveiling an upgraded take on the Gomu Gomu no Culverin. The canon attack allows Luffy to change the direction of his punch at will, and Gear Four Snake-man only got scarier from there. Luffy stepped out with two of his most impressive techniques yet. The first attack is known as Black Mamba, and the multi-hit technique sees Luffy unleash an untold number of punches on Katakuri. He is even able to hone the punches to target specific areas on Katakuri with some success, but no technique is more flashy than King Cobra. The final move sees Luffy let go of his stretched arm, winding it around himself once in a loop. The added with speed and added haki makes Luffy’s fist even bigger, and which is a truly devastating attack. Katakuri was visibly shaken before taking on the blow with the episode ends before we can see the fallout left behind the assault.